Let us take a little break from the wall-to-wall skating coverage here and show Luke what awaits him when he gets back home. There is pack of very keen Cubs, Scouts and Beavers who are looking forward to adding him to their number. These pictures are actually a few weeks old now and our troop has grown by four more since these were taken. Let’s start off with our Beavers. 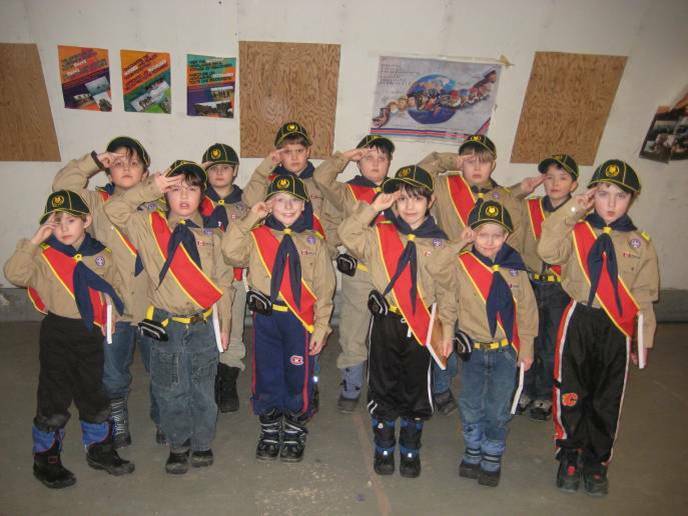 This is Scouts Canada’s program for five to seven year olds. And here is the Fort Smith Wolf Cub Pack, the program for eight to ten year olds. 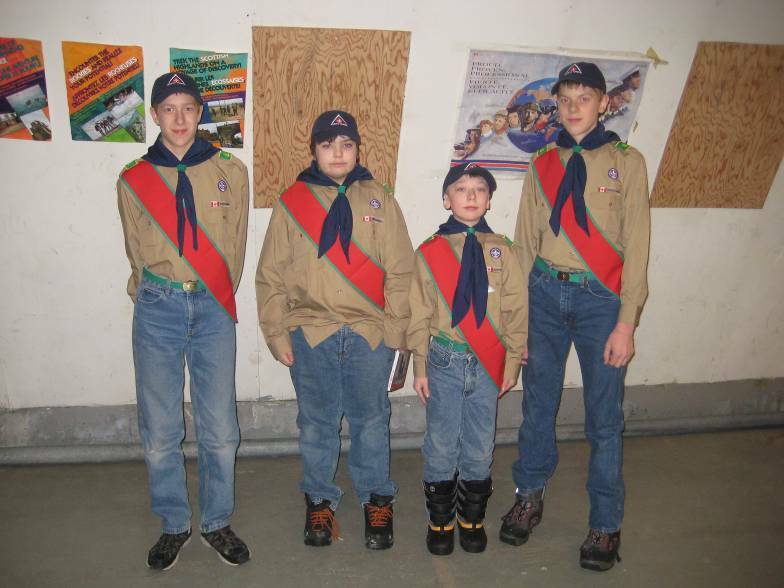 And finally, here are our Scouts, who range from 11 to 14 years old. As I noted, we have since enlarged our group. 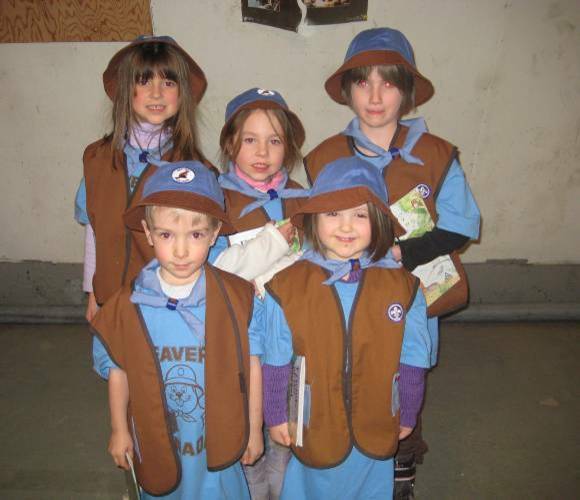 We have a new scout, a new cub and two new Beavers. The troop has gotten a lot of press attention lately, and I expect our memeebership will be growing even more now that skating has ended for the year. Anyway, my son Ian wanted me to the post these pictures for everyone to see, expecially Luke. Enjoy! This entry was posted on Monday, February 25th, 2008 at 15:34 and is filed under Fort Smith & Area. You can follow any responses to this entry through the RSS 2.0 feed. Both comments and pings are currently closed. Wow, pretty cool how well the hard work has well paid off. Take THAT, Yellowknife… Good job Tim & Dan & Chris, (and whoever else might volunteer now?). Look’in great Guys & Gals! I can’t wait to volunteer for the camping and winter components. Awesome! We are looking forward to your particpation. After i posted this, I realized that Alex is still the perfect age for Scouts. We had two more Beavers and one more Cub – Callista Bourke (a girl!) – join us last night, and Aurora Vassal is supposed to join next week. Now that skating is over, the girls are starting to join as well. Alex should think about it. I have been thinking about it, but I don’t know if I could. With figure skating and babysitting, I’m squished. Although, being a super sixer (bossing the troup of five around) sound apealing:). Even not being a super sixer, sounds fun. I would love to join. WOW I can not wait to be in scouts and tell Robbie about his shirt and iam sad to see that me and Ian will not be in the same group we will only be in the same group for 3 years WAH WAH and graice looks SOOO CUTE !!!! Don’t worry, Luke. We do lots of shared acitvities together with the Cubs and Scouts. All the games we play in the gym and the camping trips and so on are all together, so there will be plenty of opportuntiyes for you and Ian to share you adventures in scouting together. Alex, we can work around skating. The interest in the troop went through the roof after they appeared at the skating carnival and in the SRJ this week. I expect to see many more girls of all ages in the group. I will keep you updated.